In 2012, Nokia released the Lumia 920 to the market, one of the first Lumias to run Windows Phone 8.0, using the Windows NT technology. At the same time, Microsoft released Windows 8, and specifically Windows RT, the version of Windows designed to run on ARM processors. The Microsoft Surface RT tablet was released alongside Windows RT, but Nokia wanted to have their own take at it. Meet Nokia Vega (RX-107), a device made more than a year before the 2520 released in Fall 2013, sadly reported to have been cancelled by many publications along with Pine, Atlas, illusionist and Mercury. The prototype in our possession is one of the final units for that particular model. We have a F3 device, but we are aware earlier Bx devices existed in the wild. In appearance, Vega looks a lot like a Lumia 2520 in many ways. The form factor, the overall design, everything hints at it being a Lumia 2520. But in reality, both devices have a lot more differences than similarities. The device buttons are ceramic, like the Lumia 930. The SIM tray feels a bit disappointing, Nokia seems to have used some sort of rubber which has scratched off over the years. 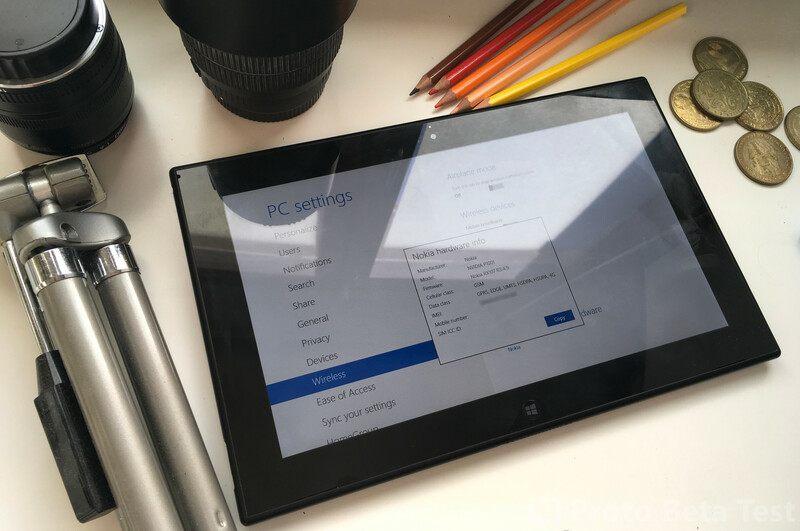 You can notice that the device uses a physical button for the Windows button on the front, compared to a capacitive one used in the final Lumia 2520. We are a bit disappointed by the usage of a 1366 x 768 screen. Despite the low resolution, however, the screen looks fantastic, with accurate colors and high brightness. The final Lumia 2520 had a non-magnetic charger, which plugged in like a headphone jack would. This type of charger is not practical compared to other solutions, like MagSafe from Apple, which are built to prevent dropping your device if you ever accidentally step on your charger. This prototype does not use the final charger plug, but instead uses a MagSafe-like one. You will also notice that the charger is also a prototype, and those are uncommon to find in the wild to say the least. It is however the same charger except for the plug, with a nice flip design for the plug, and changeable plug types. The cord seems solid and is long enough. The magnetic feel is excellent, and we can confirm it sticks well when you need it, and detaches well if you accidentally step on the cord. Present on our prototype is an odd looking rotation lock switch. It slides to the right and slides back to the left with a spring, and toggles the rotation lock. We think Nokia used this type of switch to prevent accidental presses you can have with a normal button, like the volume up/down buttons, but we don’t know why it couldn’t be a two states switch too. This addition, however, is welcome and it is a shame that it never made it into the final product. The tablet external I/O ports are protected by a trapdoor located at the bottom right of the device, compared to the final Lumia 2520, which had it at the top right without any trapdoor. This trapdoor can be pressed at the top, and rotates slightly to reveal the ports. Notable differences are found within the USB port, which is an USB 2.0 Micro USB port here, compared to the Lumia 2520’s USB 3.0 Micro-B port. Vega also sports a headphone jack, and a Nokia proprietary connector for the Power keyboard at the bottom. The SIM tray and SD card compartments are located at the top-left of the device. The device features a connector for the power keyboard accessory, like the Lumia 2520. The OS reports support for a secondary battery, so it may be safe to guess this is indeed the same connector. However, as we do not have that accessory with us, we’re unable to confirm the working state of this port. This device features an LTE modem for internet connectivity. As this is a prototype, it supports all cellular bands you could have in 2012 and is not carrier locked. The device works fine with Micro SIMs, as you would expect for a Windows 8 tablet with LTE. Vega features a 1.0 MP front facing camera with a green light indicator. It also features a 8.0 MP rear facing camera with no flash. While these specs seem pretty basic for a tablet from 2012, the Lumia 2520 ended up shipping with a 2.0 MP front facing and a 6.7 MP rear facing camera. We’re not really sure if this change was a good one or not, since both have their pros and cons. 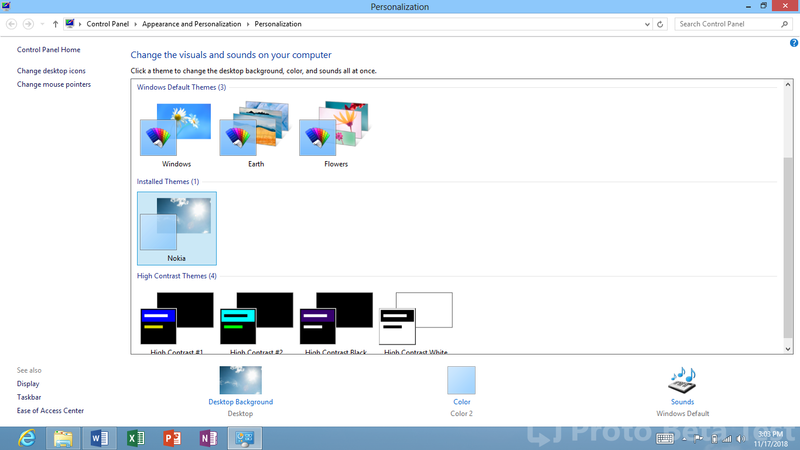 As this is a tablet, pictures aren’t great, but we weren’t expecting much anyhow from a 2012 device. This tablet features NFC support. Like on the Lumia 2520, the NFC area is located near the camera on the back. However, we noted the lack of any marking or indicator compared to the Lumia 2520. The tablet runs Windows RT 8.0 (Build 9200). 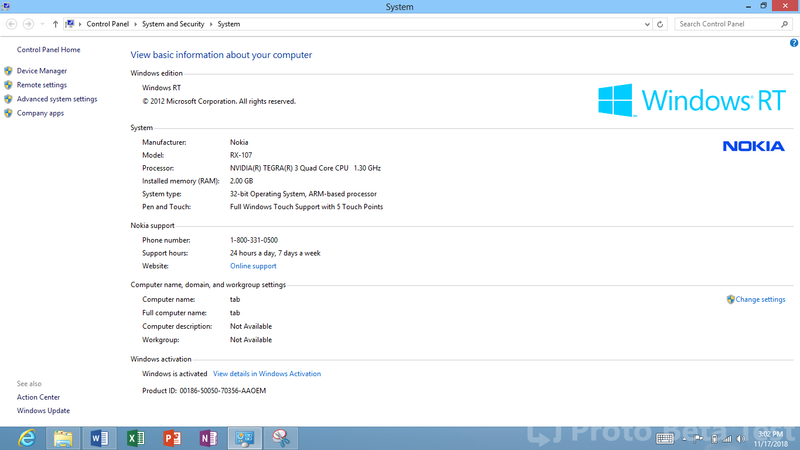 We’re uncertain if it can run Windows RT 8.1, and we’re a bit scared of trying so. It features little changes to the software it runs. We think it’s a bit too early for it to have special OEM apps from Nokia. While this may be our thoughts, this tablet is from late in development. We do, however, note the presence of a custom theme for the tablet, and OEM branding. Vega shares a lot in common with the Lumia 2520, but it also feels much different than its 2013 successor. The choice of Tegra seems justified for 2012, but we think Nokia made a good choice to use the Snapdragon 800 in the end. The removal of the rotation lock button, and the change in position of the I/O ports is sad to see. We, however, welcome the removal of the fragile trapdoor. A MagSafe-like connector felt like the best choice, and we’re not really sure why this feature got removed, as we feel that every OEM should do the same, especially for a tablet. The physical Windows button, while being better for tactile feedback, feels odd with the shape of a circle. 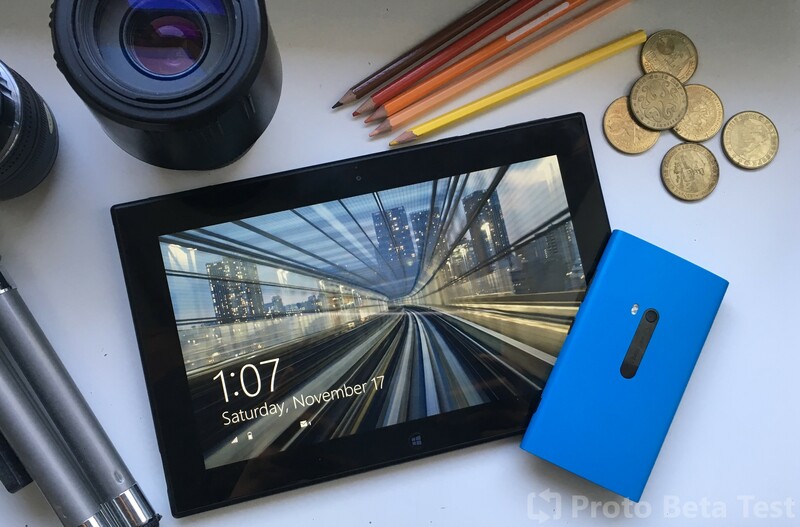 Overall, we like this prototype tablet as much as we loved the Lumia 2520 design. It feels like a rock solid tablet, being comfortable in the hand. This could have been a success had it been released in 2012 and we’re sad that in the end this device got cancelled.